You missed a great chance to title the post "Clash and Burn"
Are you talking about Clash Tour or both versions? I only have extensive experience with the Tour. It’s my wife’s racket and she didn’t like the lack of heft with the regular Clash. I hit with it again both versions .. The tour is better for me . But what I can’t get over is the launch angle . The exact same swing with my racket . I forehand topspin roll from my baseline , over the net and bouncing into the oppositions service boxes. So a short roller with my racket .. now if I try to do that with either clash the ball goes to the baseline with the intention of landing in the service box . To me that creates anxiety and fear . To me it feels like a flexible vOlkl V1 with Babolat pure drive super oversize power..
so it scares me . Which is interesting as it’s the same feeling I got when I first hit with a Babolat pure drive in 2004 . Maybe poly in the mains and a multi (at higher tension) in the crosses would be good for lowering the launch angle a bit? My experience echos yours. My wife hits a more consistent deeper ball with it but I get nothing good out of it. That’s why I’ve facetiously labeled it the 3.5 ladies racket. What a great testimony written above ! GreAt and super informative post loved this! I too echo all of this but could never write it out this good . Have a 3.0 3.5 ladie who is a client . She was using a pure aero vs . With lead! Strange I know . Strung with pro hurricane at 58 lbs . Her old pro set this up for her . And told her this is what I use so your gonna LOVE IT ! She came to me 3 weeks ago in an arm brace and considering surgery for wrist pain. First thing first get that racket out of her hands . To make matters worse she was using a grip size 0. How on Earth ? Didn’t know these came in 0 ? Well they don’t . Her old “ pro” widdled it down to a kinda 0 ish size . Anyway I grabbed the softest demo I had with a grip size 4. Hate this grip . It hurts my wrist . Hmmm I said well hit 5 balls and then see . She did and her pain dropped a bit . Nothing miracle . But a liked where we were headed . Finished the private with that. Next lesson the clash demo was in . We proceeded the lesson with it . A built up grip to a 4 . 4 and 1/2 that is . She played ok . But more importantly a lot less fatigue and less pain . I was excited she was over the moon . She bought 2 that day ! Score for Wilson . And it made me happy to see her hit w/ out wincing in pain . Said is not for everyone but for some it’s the perfect frame . And my biggest pet peeve ..
3.0 players have NO BUSINESS USING POLY . Definitely this is the group I'd target with this racket. As I said above, "3.5 ladies racket of choice"
Yes I agree. 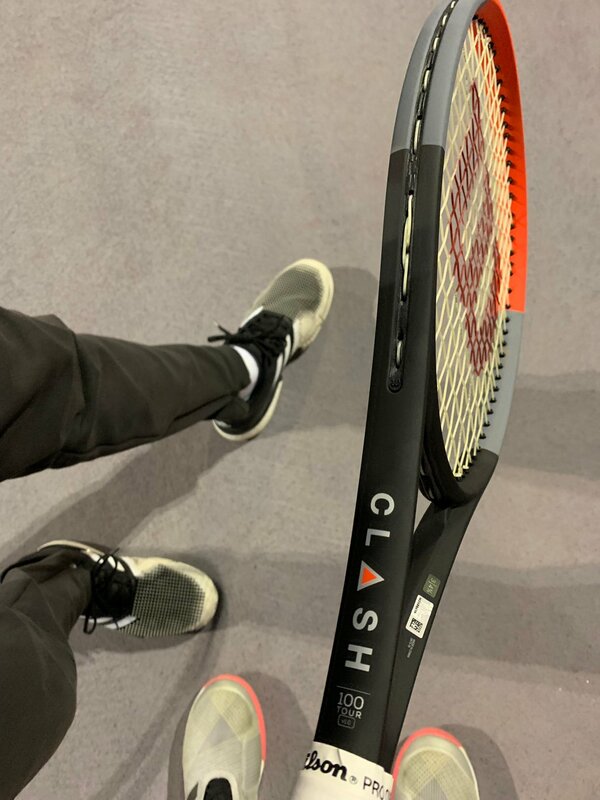 My wife has poly in her Clash but only because it was the free string they offered when she bought the racket. But she'll be moving to multi with her next stringing. Poly should be banned for beginning players. Reported to TT Customer Premier Support. Missed another great opportunity to produce a line of 6.1 frames. They only need to produce a 16x19 and a 18x20. A lighter version of each and the 12.3 version of each and take the tennis world by storm. The majority of professional players using Wilson are using them covered up with Blade and Pro Staff paint. Those frames would be used by the juniors collegiate players, 4.0+ men and women players. Great market for it. I just came back from testing. Clash 100 > Clash 100 Tour. The light version is an easy and fun racquet to play with that does most things good...very solid for its low weight. I would definitely recommend it to a recreational player that wants sth to start with. Very arm friendly and that’s it. Just a decent light racquet like Dr 98 Light, Prince 100T and many other good sticks out there. Tour version gives you the feel that it punches the ball harder than the light version and obviously feel and feedback are better. But does it gives you better results ??? NO. What a weird rackquet Wilson has produced. The only thing that Wilson revolutionized is INCONSISTENCY!!!!!!!. Inconsistency on this racquet hits new levels. It’s not like baboblasts where you just have to tame the power. It behaves very weird. I enjoyed the feel... people are wrong when comparing it with prince racquets. It’s sth unique and different. Very plush and soft but not muted. For a modern stick feedback is more than ok!!! But WTF is wrong with this racquet??? Performance is bananas. Some said that the harder you hit the more power you ll get.... and more control when you tone down a bit. Yeah it happens but the problem is that same behavior can happen on the other way around. I kept wondering why some of my shots when were technically correct balls will behave as it should and the next time when i tried a similar swing the outcome would be different. 1) I can’t believe why Wilson decided to give at a tweener stick such a small sweetspot. It gets unbelievable powerless on shots outside the center. You can’t play defense when opponents open up the court and you are on the run. Also it lacks punch on serves. MUCH of plushness . You must have fast swing. The longer the ball will stay on the string the more it will behave like a slingshot with various unpredictable outcomes. Also those who play flat just forget it. If you won’t apply a decent amount of top spin it will behave like a baboblast. It gives you ZERO CONFIDENCE to attack on the ball. It didn’t give confidence even when slicing the ball. Ball stays a lot on the string but it’s like having ZERO byte. So you feel the ball but in the same time you don’t know where the ball will go....and i am referring in terms of depth where it will land not the direction of it. 3)It shouldn’t be so headlight. Another reason of spraying balls when going for winners. It lacks weight on the head. Clash tour is a HUGE NO for me. I am not interested to loose time and tame it. If only 98 versions will have a thinner beam i will give them a try. Burn CV is one of the best 100inch racquets Wilson has ever produced. Specially the S version. It has the power of baboblasts but it also gives you the all around game of a smaller head size. I don’t know what went wrong with marketing those sticks. Maybe they didn’t marketed them at all. I am very disappointed with most of the modern racquets i play with. If only next Blades will be completely trash like the CV versions then i ll have to stock up some more 2015 Blade’s. Ps- due to its inconsistency I was trying so hard to produce shots on sweetspot and as a result i got sore elbow at the end of my testing. What string and tension setup did you use? I am experimenting with different setups before I say yay or nay. If I say nay. Someone will get a good deal on ****. Exactly what I had on my demo Clash Tour too, and my eperience with the racquet is very close to yours. This is for sure not a racquet for me. However my good friend 3.0 player got both more power and consistency when he tried the racquet. I have no idea how, but standing on the other side of the net could surely tell. I dont get this racquet, but I am sure that it can be the right one for some players. Sensation is a horrible string. Mushy and no feel. I like multi strings, but never tried sensation before. The racquet came strung with sensation. I dont think I could blame the strings for the low unconsistant performance of the Clash Tour. Good news for us looking to purchase a Clash tour. Will check **** and pick another one up cheap! Great racket for me, reminds me of the old nsix.one only better. You need some poly, pump the crosses 4lbs higher than mains. You'll find the consistency. I think 2 versions feel very different. But they have the same problem: launch angle. Too high for some shot. Make you lose confidence. All you need is to lock down the string bed a little. I strung 2lbs higher in crosses. It's totally new chapter. Dream on. Just buy the Clash and see for your self. I can actually play fine with sensation. I just don’t like the sensation it gives me. A high performance formula 1 race car driver is not just responsible for driving the car fast, but he is also responsible for understanding the setup of the suspension and brakes and communicate to the team how to get even more performance out of the equipment. The Clash and n95 do share a similar muted feel but the Clash is much easier to use. Can you get the launch angle lowered with a multi setup ? I typically use multis in my wife's rackets since she's a flat hitter and doesn't need the spin of poly strings and certainly doesn't need the arm issues from poly. I've got some Triumph from Tier One and thinking of replacing the Lux Smart with it for her with her next stringing. The Smart at 52 lbs definitely launches the ball high. I was thinking Triumph at 58lbs but maybe 54 mains and 58 crosses? I don't think full multi will work. But you can try hybrid as crosses. String 4lbs higher than mains to see. But IMO you don't need multi in Clash. Yonex Spin G 55lbs without any arm issues to me. It has the most stiffness among poly strings but Clash frame really comfortable. I just don’t like the sensation it gives me. Been using the tour for a month now and love it. No control issues. My hitting partners are a former challenger level player now in his late 30's and a 21 yo formerly nationally ranked junior so it's not that we're pushing the ball around. I didn’t experience any major control issues with the Clash Tour during the demo at the Revolution Tour event either. Compared to the standard Clash, I just felt better connected with the standard and I prefer platform frames that I can lead up. These are both really good frames. Absolutely no control problems here. I played with Clash for extended periods of time over the weekend. I had played with Tour version when it wasn't officially released and now after a few players I know purchased the regular version, I gave it a spin again. My usual racquet is Angell TC97 18x20 these days and played with TC100 before that. I always have 2-3 of same type because I like to rotate and in case I break strings. A little background about me: I gravitate towards comfort and control-oriented frames but that is rather recent in the last few years. I did play with Babolats for over a decade (H.S and DII College) so very varied racquet background for me. I am in my mid thirties and well aware of how I am losing half a step with age (I still hit with DII college players) and health is becoming more of a priority as well. So coming back, I tried the Clash today and Clash Tour in prototype PJ earlier. I actually liked the Clash, not going to lie. I did not like the Tour as much, but regular Clash is a good stick. The racquet was strung at 52 lbs. Luxilon Element I think it was. Never felt disconnected. Wonderful comfort. And yes, it was ample stable. I did not feel it wobble or twist and I was hitting with #3 player in the college team line up who hits a big, heavy ball. I did feel that I wasn't getting enough depth on court and was leaving ball short even after taking full swings, but nothing a few grams of lead can't change like @SpinToWin alluded to early on in the thread. I also can't seem to agree with how people are saying it has a ridiculous high launch angle. I think even bed 52lbs gave a reasonable launch angle, similar as you would get from say a PD. So I don't know. Pretty normal in my opinion. So my two cents are that it is a great frame for rec players. It is soft and won't hurt your arm and I am all for industry going in that direction. I mean don't get me wrong, I hate the whole "Revolution" marketing and the hype bit as much as the next person. But can't take away from the fact that it is a good racquet and I can see rec players using it to their advantage. Some are bound to like it, some won't. But that is how it is with every racquet out there. I don't like to waste words Toby. Great review! Your impressions mirrors mine to a T! the regular Clash works better for me than the Clash Tour. Also at 52/50, no issues with the launch angle either. Really enjoying the frame a lot so far!